Posted on November 17, 2011 Author Ms. Collins	1 Comment on Oobleck! Last Thursday we had two guests in class: Mr. and Mrs. Collins. My mom and dad came to share a story and do some science. The kids were very excited! Mr. Collins read “Bartholomew and the Oobleck” by Dr. Seuss. It’s a story about a king who is tired of sun, fog, rain and snow, so he orders his magicians to create a new kind of weather. 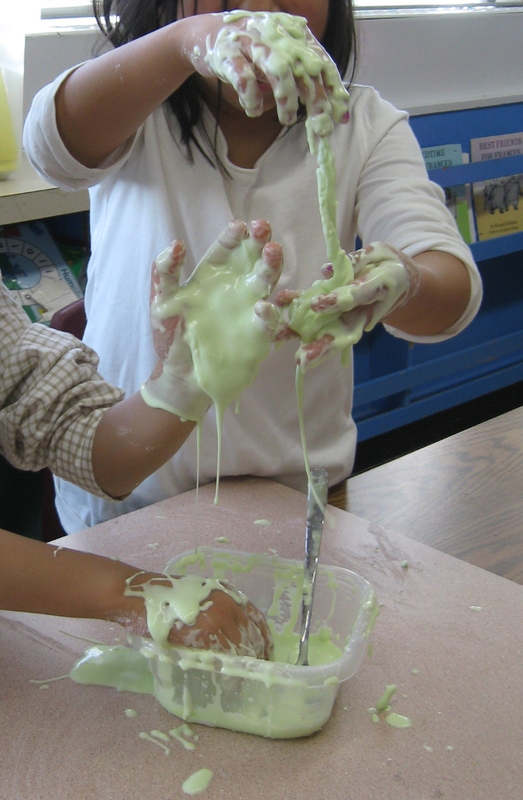 They create Oobleck, which falls from the sky as sticky green blobs. The king is fascinated at first, until everything and everyone in his kingdom is covered in the stuff. Bartholomew helps the king to see his mistake, and when the king says “I’m sorry” the Oobleck melts away. After listening to the story, Mrs. Collins explained how to make Oobleck. We mixed 1 cup of cornstarch with 1/2 cup of coloured water. The students worked in pairs to stir their Oobleck, taking turns holding the container and stirring. The result was goopy and sticky, but we couldn’t decide if it was a solid or a liquid. You can roll it into a ball, but if you stop rolling it oozes through your fingers. After lots of exploring, and a little mess, we came back together to talk about what we discovered. We learned that Oobleck is a non-Newtonian fluid; it isn’t really a solid or a liquid. When you apply pressure to it by rolling or squeezing, it feels like a solid. When there is no pressure it acts like a liquid, dripping through fingers and taking the shape of its container. Then we watched a video of dancing Oobleck. The sound waves from a speaker make the Oobleck dance. I loved having my parents visit, and they like coming since they are both retired teachers. Plus the kids got to be messy and do science. It was a really fun afternoon! This work by Amy MacLeod is licensed under a Creative Commons Attribution-NonCommercial-ShareAlike 4.0 International License.